Can arts and heritage digital projects tackle deprivation in Hastings? We began looking into how to build a town-scale digital arts network. The underlying idea was to create a space for street-level live heritage or arts experiences using the broadband network. 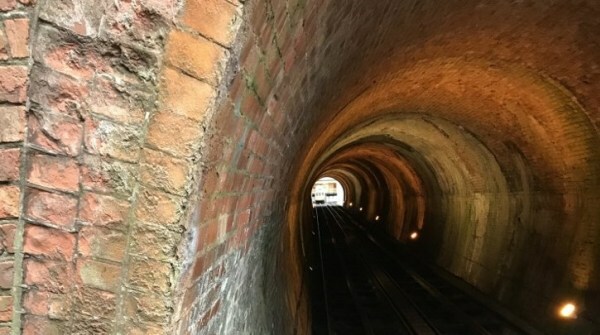 Up the dark, steep tunnel of the West Hill lift in Hastings, a Victorian funicular railway, two figures are tethered to climbing ropes high above the streets of this tourist hotspot. Ian McInnes and his workmate from TechnologyBox are threading a fibre cable to complete another node of the town’s broadband network. Ian climbs up walls, down ducts, and through ducts and tunnels underfoot, laying cables in places people have long forgotten existed to build the bare bones of the network. Running cables up the West Hill funicular railway in Hastings. Copyright Technologybox Ltd. When my partners at MSL Projects and I initially looked at the town’s plans for free wifi in 2016, we couldn’t identify any plan to develop audience, business engagement and tourism benefit using the free connectivity. The overall cost of setting up ten access points across central Hastings was around £42,000 for three years of high capacity access and maintenance over the period. However, no funding was allocated for programming, business development, or arts activity in the original bid for the WiFi Access points. Digital infrastructure needs programming to meet real needs across communities and the business landscape. So, working with other local community activists, we began looking into how to build a town-scale digital arts network. We wanted to create a space for street-level live heritage or arts experiences using the broadband network; what you might call a "Museum on the Street." 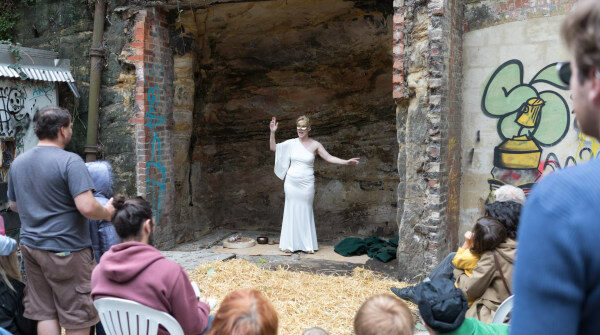 Storyteller, Emily Carding, performing ‘Spirit of the White Rock’ for Storylines 2017, MSL Projects. Photograph by Alexander Brattell. Copyright 2017. Hastings is a small coastal town of around 90,000 people, with high unemployment, and scoring high on social indexes of deprivation and homelessness. According to official figures, it is counted as one of the UK's 20 most deprived towns, and some council wards in town are in the bottom 1% of the whole UK (DCLG and Hastings Borough Council figures, 2017). Public funding for heritage and arts digital projects is increasingly hard to find. Local authority finances have been cut massively; ten years ago there was many times more funding for the council. There's little local funding for conventional websites, and no money to maintain them. A new approach is needed to extract value from what has already been digitized across the town environment. We hope to tap into the unexploited, mostly undiscovered, historic data landscape around us. 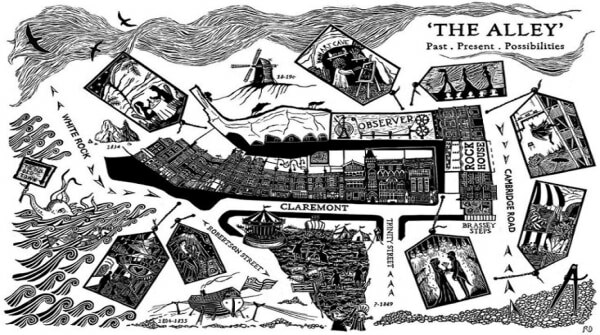 Illustration of the Alleyway project in Hastings. Original image created by Rowena O’Reilly for MSL Projects and White Rock Neighbourhood Ventures. Copyright 2017. The town has great potential for the arts, tourism and perhaps, eventually, a creative industry cluster. There is an extensive historic built environment, and the town is in the top 20 UK historic places in the RSA Heritage Index database, confirming that Hastings has exceptional unrealized tourism potential. For example, our town museum, Hastings Museum and Art Gallery, has an excellent physical collection and a small online collection, but on the streets there’s little evidence of this to be found for mobile Web users. Despite a significant and growing mass of non-museum public data (including archive and census information, local newspaper archives, records, survey data, and street, architecture, and building control plans) the history of place is mostly still locked away in paper archives or offline databases, few of which join together. An old newspaper office building, known as Rock House, survives as a co-working space for local creative media workers and SMEs. On top of Rock House is a very powerful broadband aerial with substantial spare capacity in the contract agreement. This led Rock House co-workers to create a brand around their fountain of connectivity called Rocknet, and it is the spare capacity Rocknet provides which is the core of our digital arts and heritage community exchange. One big advantage of managing the connectivity environment across a cultural site is the ability to track audience habits, usage of certain zones, the best time of day to visit, and so on. 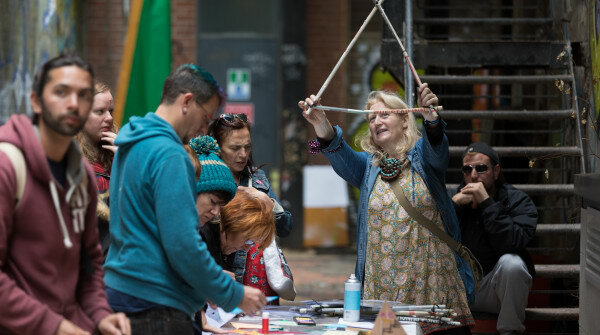 With WiFi access points across most of the central historic street site, Technologybox has trialled visitor tracking during our first arts activity, a combined arts event called Storylines which happened on September 10, 2017. Artist, Lucy Brennan Shiel, for Storylines 2017, MSL Projects. Photograph by Alexander Brattell. Copyright 2017. Use a splash page sign-in to collect demographic details about the audience. We found around 10% of visitors detected by the access point connected to the WiFi network, meaning they had engaged, however fleetingly, with the broadband. This was higher than expected, and likely a result of a combination of good communication from event staff who had been briefed to introduce visitors to the connectivity, and (very helpfully), the poor 4G signal across the locale. Our infrastructure was under our control, designed for high speeds and dense crowds. Providing free WiFi also meant our audiences weren't using their data allowances, reducing the barriers to their participation in the digital elements of the event. We found we can programme engaging community-centred, participatory events which the digital environment allows us to evaluate activity on the fly, giving us a real advantage when developing funding and sponsorship plans. We can begin to get to grips with deprivation in the town by offering connectivity to new businesses, work experience to young people within the digital and arts programmes, and partnership opportunities to local bodies like the Library and traders in the streets around. This is about delivering the beginnings of a local-scale circular economy. 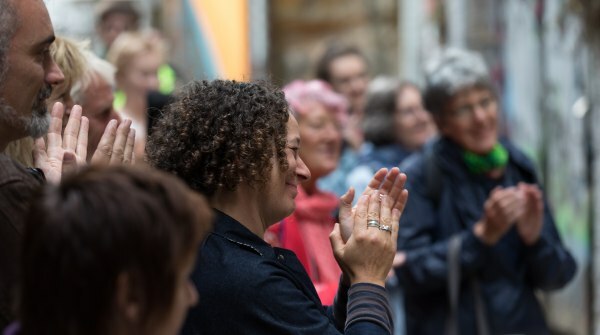 Last year’s pilot shows we can deliver, and this August, funded with just £10,000 of regional funding, we’re premiering two summer-long programmes using the connectivity. Firstly, a prestigious Royal Institution Masterclass series for young people, based at Hastings Library, and secondly, a Creative Media Summer School for young people from low-income families at Rock House. Storylines 2017, MSL Projects. Photograph by Alexander Brattell. Copyright 2017. Now programming our first full summer of arts and heritage activity, we welcome any help RSA fellows can bring. We’re certainly interested in broadening the reach of the activity from arts and heritage towards business and third-sector partnerships, and help using this project to advocate for wider use of the Heritage Index data would be welcome too.